Custom plastic cards are useful for various applications including courtesy cards, cash cards, VIP cards, promotion cards and much more. We also make various types of card holders which are a great way to present your impressive custom plastic cards to your customers. Plastic cards are custom printed in full colour with a compressed gloss laminate on both sides that will highlight your artwork and provide protection. Options include: polyester card stock which is waterproof and long lasting and paper card stock that is suitable for short term use. Consecutive numbering and variable data printing is available as well. Contact us for a quote to add a signature strip on the back. Minimum order is 100 units. Card holders are a great way to display your custom gift cards, loyalty cards and much more. Card holders are printed in full colour with your custom design, logo, company info and corporate colours. Minimum order is 100 units. Contact us for a quote on a different size or style and for offset printing prices. 4″ x 5″ folders with a pocket and card slits on the inside • 4 1/8″ x 2 7/8″ card holders (when folded) with angled card slits on the inside right panel • 3 1/2″ x 2 1/4″ gift card sleeves (two styles available). 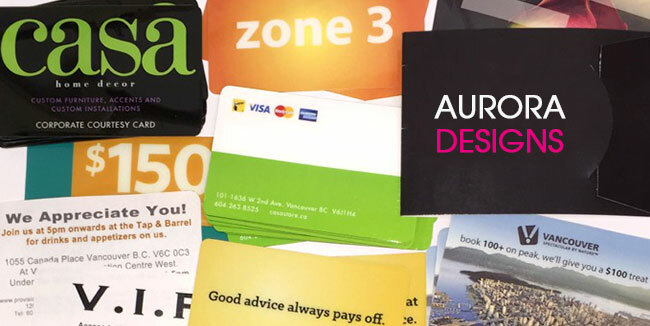 We custom print and die cut your plastic cards and card holders on site at our Vancouver, BC location. Plastic cards and holders are digital printed in full colour (CMYK). RGB and Pantone® colours will be converted to CMYK. Plastic cards and card holders are stacked in boxes with packing paper. Visit our stickers, key tags, fridge magnets, and coasters pages. Also, take a look at our Idea Guide, which provides popular promotional products for various industries and events.